Decent, affordable and accessible housing for all city dwellers is surely a desirable goal. However, in a large city like Bangkok (official population: eight million in 2010) ensuring adequate and affordable housing for all can be difficult. There are multiple competing pressures for land, and private commercial developers play a big part in shaping both land and housing markets. One approach to maximising land usage is through high-rise construction ("densification"). However, few private developers cater to the lower income bracket; low-income households have historically moved into informal settlements in the city, where neither household nor settlement density may conform to official standards. Official policies for low-income groups in Thailand have ranged from provision of public housing in the form of flats, to "sites-and-services" upgrading1 (Giles, 2003).However, the main obstacle to providing public housing has been the availability of affordable land on which to build. 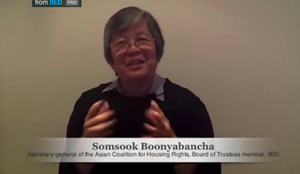 More recently, in 2003, Thailand adopted a two-pronged approach to housing: demanddriven, through the innovative Baan Mankong participatory slum upgrading programme (Boonyabancha, 2005); and supply-driven, through the public housing approach of Baan Ua- Arthorn (see Box 1). Only Baan Mankong continues to be implemented today. This study sets out to understand the housing preferences of low and lower-middle-income communities, and whether these preferences are met by the different levels of population and housing density across three different types of low-income housing. The traditional view of a low-income, informal settlement is of an overcrowded space that has both a high population density within its land area and within each unit. This paper seeks to investigate whether this high density (at the level of both the housing unit and the settlement or community) is observed in practice, and whether it is perpetuated in both community-driven and public housing projects. In this study Baan Mankong represents the community-driven housing, while flats built by the National Housing Authority (NHA) represent public housing projects. We also examine what the implications of varying densities are for the project residents' levels of satisfaction with their neighbourhood. 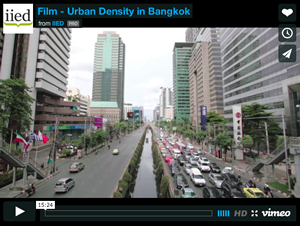 We examine the population density to see the relationship between density levels. This allows us to see the relationship between density levels and socio-economic conditions; and satisfaction levels across the three housing types. In turn, this provides a basis for exploring the role of existing building regulations in shaping housing form and density; ongoing government housing programmes and policies; and the wider implications for the processes of densification, land use change, and value in a rapidly developing urban area. While bearing in mind that the study is based on a small number of settlements – which may not be representative of all settlements of each type – it is possible to draw some preliminary conclusions on the relationship between satisfaction and density from the results presented in this study. Both NHA settlements have the highest levels of density at the settlement scale, despite having the largest proportion of open space. Meanwhile, the non-upgraded Wat Phrayakrai settlement (as opposed to the part of Wat Phrayakrai that was upgraded following a fire) is the least dense – thus suggesting that not all "slums" conform to the stereotype of over-crowded and densely built-up spaces. However, at the level of individual homes, the Wat Phrayakrai slum homes are the most densely inhabited. When it comes to satisfaction, the three Baan Mankong upgraded communities demonstrate the highest average levels of total satisfaction and neighbourliness, and it is possible that this is due to the community-driven and participatory process of the settlements' design. Satisfaction levels across the different types also appear to be related to density levels across these settlements. These results suggest that housing approaches offering the most satisfactory and affordable living conditions to low and lower-middle-income communities are those which allow residents' input into house and settlement design. Consequently, government-supported housing programmes should allow for this.